Based in Dubai and have no time or enough skills to run your social media? No problem. Let us do the hard work for you! By utilizing our Social Media Management Services we will enhance your social media presence and increase the recognition of your brand, promote your services and products to a wider audience and as a result drive more targeted prospects to your website. Being active on social media is as important as doing your search engine optimization (SEO) for your website. First of all, before we do anything, we will find out more about your business, your main activities, services & products you have, the industry you are in, your competitors, and target audience. Then we will prepare a targeted, well-curated content with the popular #hashtags that can greatly benefit your business and help you reach wider audience. Once we have finalized above, our team will provide a daily stream of relevant content that informs, educates and entertains your audience and keeps them engaged. As we are located in UAE and know Dubai traditions, customs, lifestyle and so on we can assure you we will handle the Social Media Management Dubai way! 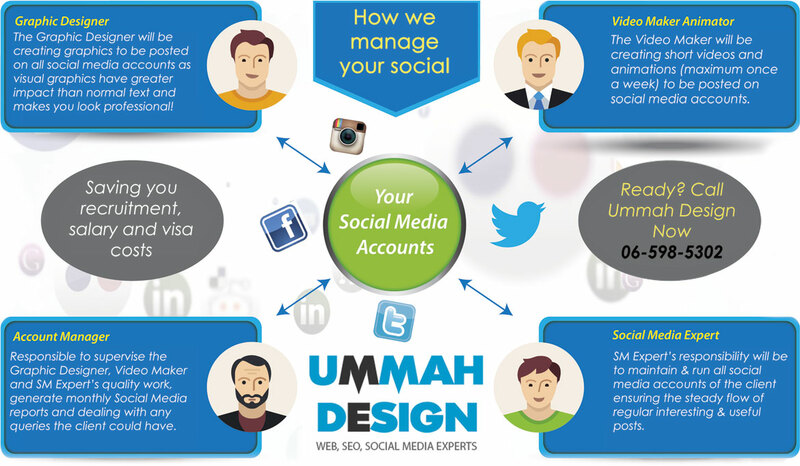 Whether you are located in Sharjah, Dubai, Abu Dhabi or anywhere in the UAE we can still work on your social media. We know no geographical limitations. The packages mentioned below are fully customiseable - mix it, swap it, come up with your own package and just let us know! Make your own perfect social media package with a budget you can afford! We increase your social media followers, improve your exposure, create brand awareness and help you find new customers! Depending on the social media package you choose we provide monthly or quarterly reports so you know how we are progressing with your social media. Would like to start now?